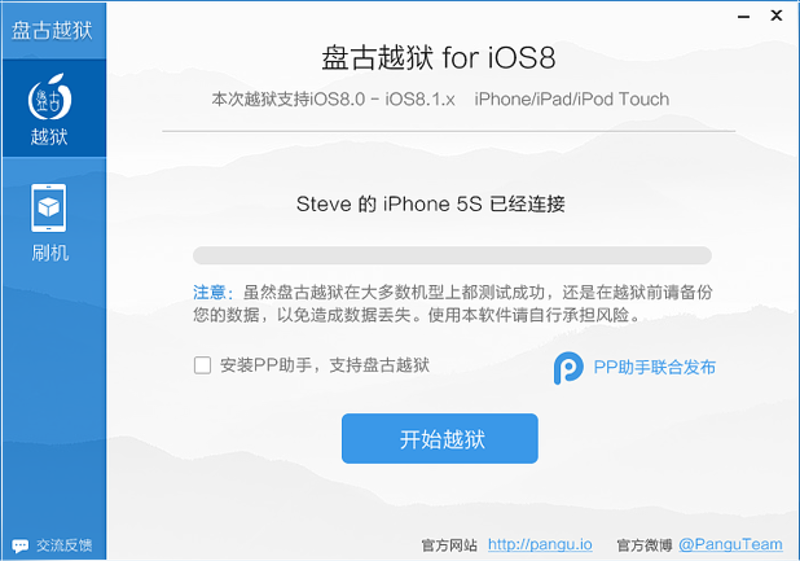 The PanguTeam has released a Pangu8 utility for Mac OS X that can jailbreak iOS 8.0 – 8.1. 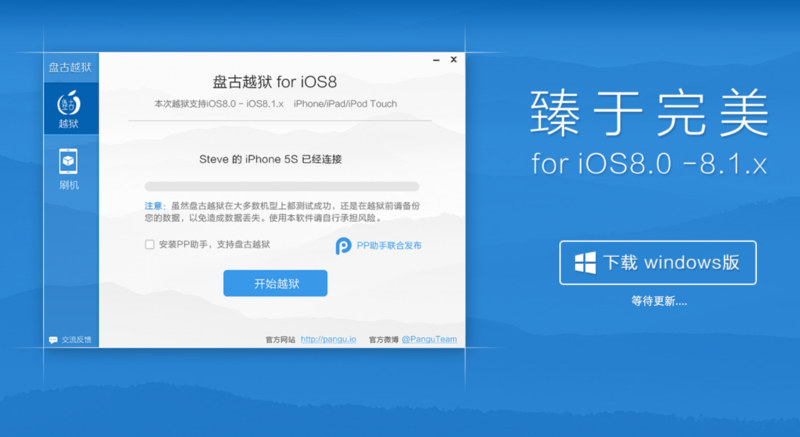 You can download the latest version of the Pangu Jailbreak utility for Windows and Mac OS from here. If you haven’t jailbroken already, you can find our step-by-step instructions on how to do so here. The PanguTeam has released Pangu8 1.2.1, an updated version of their utility to jailbreak iOS 8.0 – 8.1. Cydia 1.1.16 resolved the iOS 8 “Restore from Backup” issue, increased iOS 8 multitask timeout, improved App Store redirect block, and fixed the login dialog on iPad. You can download the latest version of the Pangu Jailbreak utility from here. If you haven’t jailbroken already, you can find our step-by-step instructions on how to do so here. This is step-by-step instructions on how to perform untethered jailbreak of iOS 8.0 – iOS 8.1 firmwares using Pangu8 for Windows. Supported firmwares: iOS 8.0 – iOS 8.1. 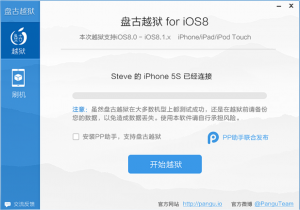 The PanguTeam has just announced the release of their Pangu8 jailbreak utility for iOS 8.0 – 8.1 with a working version of Cydia included. 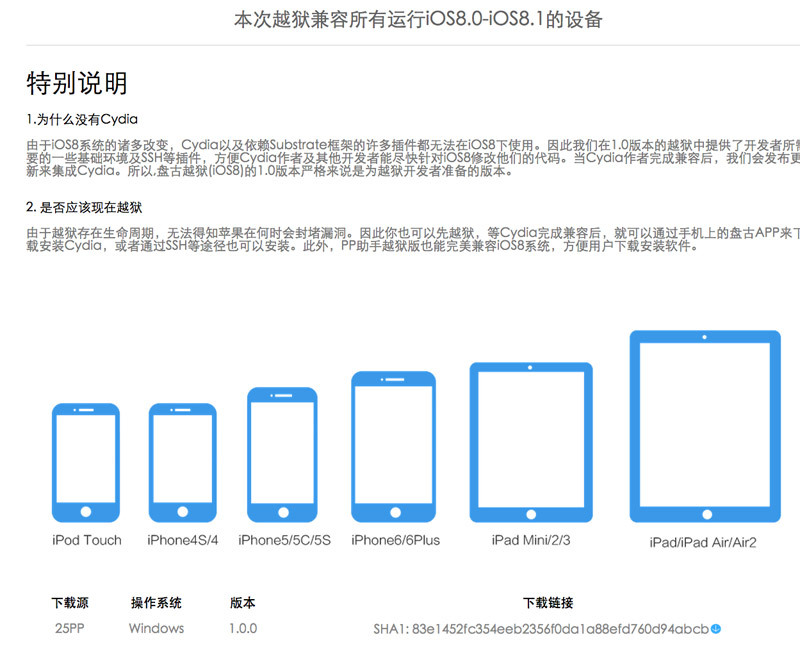 This marks the first user safe version of the iOS 8.0 – 8.1 jailbreak to be released. A previous version of the utility intended for developers was released last week. We’ll be posting the full instructions on how to jailbreak your device using Pangu8 version 1.1 shortly. You can download the Pangu jailbreak utility from here. UPDATE: Step-by-step instrucation are available here. 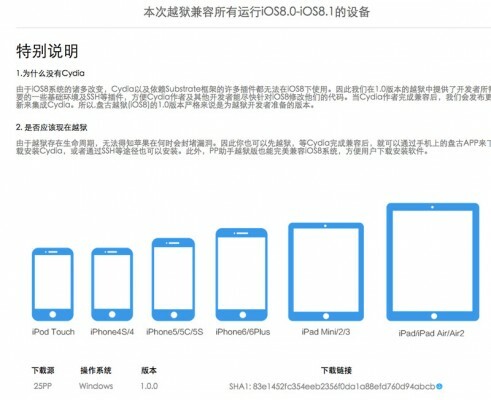 The PanguTeam has announced that it will release an updated stable version of the Pangu8 jailbreak soon with Cydia included. Also we plan to release Pangu 1.1 in 24 hours with Cydia bundled and english support if everything goes well today. Pls be patient, tks! We will be posting tutorials as soon as the jailbreak utility is released. For those wondering, it’s likely that the new jailbreak utility will still be Windows only. Saurik has just released an update to Cydia that brings us one step closer to a stable jailbreak. Cydia 1.1.14 no longer causes your device to lock up while booting on iOS 8 when you use a passcode. If you have installed unsupported modifications you may want to restore and jailbreak again, as those modifications are not supported. Cydia now backgrounds almost like a regular application (but only on iOS 8). This has been a major architectural change: please alert us to any issues. This allows you to switch back/forth between Cydia and other applications (Such as Safari, or the Google two-factor authentication app) without losing your package selection state. One of the biggest complaints about Cydia in the last year has been a new kind of ad seen on some repositories: a sudden redirect to the App Store. Cydia now blocks “popups” and asks the user before opening the App Store. Cydia supports rotation on the iPhone 6 Plus and has a new @3x icon and tabbar. Cydia renders at the native resolution on both the 6 and 6 Plus. Cydia on iOS 7.1 had an issue where playing video would cause the device to “lock up”. This bug has finally been fixed! The new iOS 8 video issue (a YouTube error message) is also fixed. Users of Cydia 1.1.13 (only available via a manual installation process) may have noticed Cydia only displayed in English . This has been fixed! Yay! Sometimes Cydia would not have packages queued but claim it did, or would have packages queued and claim it did not; this happens less ;P.
Saurik also notes that there are still some issues specific to iOS 8. Hopefully now that the major passcode issue has been resolved, we may see a stable release of the Pangu jailbreak utility with Cydia. The PanguTeam has just released an update for their utility for untethered jailbreak of iOS 8 – 8.1. According to what the hackers write, this update contains important improvements and bug fixes for Cydia, Mobile Substrate, iMessage and Safari. 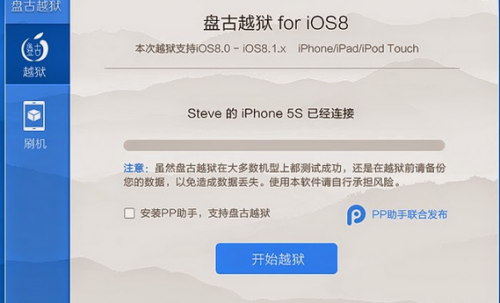 Those who had problems with these apps or those who waited for the stable version of Pangu8 can now upgrade to iOS 8.1 and jailbreak their devices with no fear at all. Everything will work fine, the developers claim. The incremental update fixes the Cydia Substrate loading issue upon reboot, iMessage picture sending, and Safari bugs. It’s advised that all jailbroken users update now. And now let’s find out what one should do to update the jailbreak utility created by the Chinese developers. There’s nothing complicated. You need to launch the Pangu app, which should be located on your Home screen and then you need to tap the Manager tab at the very bottom of the screen. One more tap on the arrow button and the download begins. After a while, your device will reboot and that means that the installation of the update for the untether is successfully finished. Have you experienced any difficulties? Leave your comments below this post. 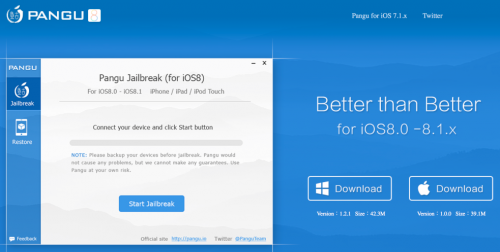 The PanguTeam on Saturday released an important update on the status of its jailbreak utility for iOS 8 – 8.1. 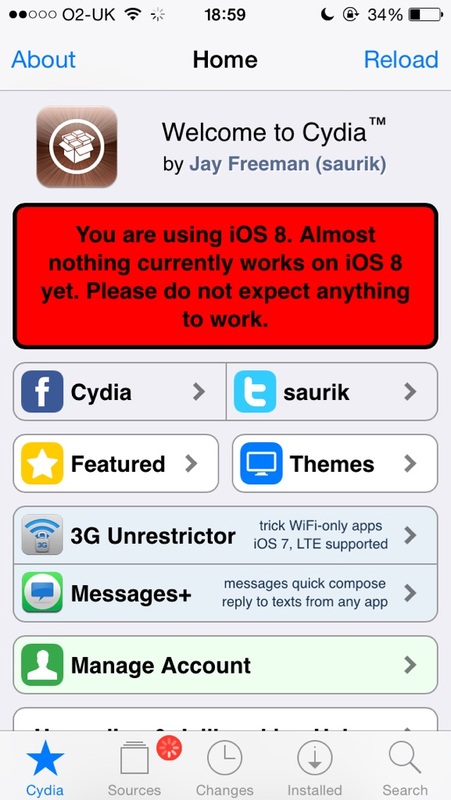 As you probably know, earlier this week, the hackers released a new version of untethered jailbreak for iOS 8 – 8.1. It should be noted, however, that this version turned out to be very unstable and was available only for Windows users, that is why the PaunguTeam decided to pull the update back and make it available only for jailbreak developers. A couple of days ago, Cydia and Mobile Substrate were not working and in the same state they remain now. The hackers say they are currently working hard to make the jailbreak utility work fine as soon as possible. They also ask to keep patience and wait for further updates on the topic. We are working with @saurik to make Cydia stable asap. Also we are fixing bugs include Safari and iMessage problems. Please wait ..
To make your iOS device compatible with iOS 8 – 8.1 ready for untethered jailbreak, I suggest that you should upgrade to the latest firmware version, which is iOS 8.1 using iTunes. It is a bit safer than using a Software Update option. Stay tuned for more news on the topic. Saurik has released an iOS 8 compatible version of Cydia for manual download following the release of an untethered Pangu jailbreak for iOS 8 – iOS 8.1. I’ve given a new version of Cydia Installer in the form of a standard jailbreak bootstrap for inclusion in a new version of their jailbreak. I’ve also pushed the .deb of the iOS 8 version of Cydia to apt.saurik.com for manual download, but not yet to my repository. A lot of thanks goes out to limneos, who tested the new build for me, as I was at an airport (and now am frantically typing this message while they figure out how to retract the jetbridge from the plane I’m on that is about to take off). Recently the Pangu8 jailbreak was released for Windows only, and without a compatible version of Cydia. Now that the compatible Cydia deb has been released you can download it from here: http://apt.saurik.com/debs/cydia_1.1.13 … os-arm.deb. Advanced users can then SSH into their iDevice, copy over the files, and issue the following commands to install Cydia. It’s likely that the Pangu8 jailbreak utility will be updated to include Cydia very shortly. If it’s not, we may post a detailed tutorial to help those who aren’t familiar with SSH. 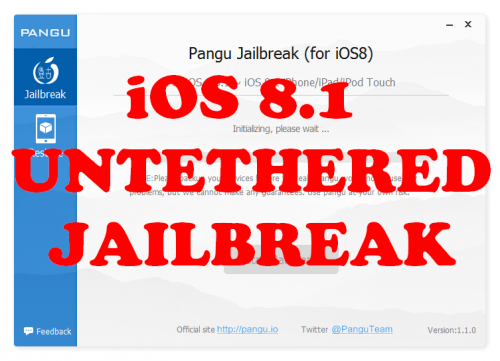 The team behind the Pangu untethered jailbreak of iOS 7.1-7.1.2 has released a Pangu8 untethered jailbreak for iOS 8 – 8.1. Currently a jailbreak utility is only available for Windows and at this time Cydia and Mobile Substrate are not working. Backup before using pangu jailbreak tool. Although this tool is tested successfully on most devices, we still hope you backup your data to avoid data loss. Please turn off the screen password lock and close the “find my iPhone” feature in the iCloud settings before jailbreak. 2. the firmware upgraded via OTA may cause failure. The firmware upgraded via OTA will have a lot of influence factors. If you have several failed attempts, Please try to download the latest firmware and restore your iOS devices. In addition, Pangu (iOS tool now add a function to restore iOS devices and execute automatic activation, you can try click the jailbreak button after restoring, and Pangu will automatically activate your device and do jailbreak. 3. “Storage capacity is almost full.”? This is because the jailbreak program will write important files into the system directory and cause alarm, it will not affect the result. When the Cydia be compatible, click on the Cydia will launch the directory moving process. Because Apple made a lot of adjustments to the system, you cannot use afc2 plug-ins at present. Do not delete “com.apple.mobile.softwareupdated.plist”, otherwise it will cause system failure. Please enable the Airplane mode and close Wifi and then try to jailbreak, or if not successful, please restart your devices and then try. If it still fails, please use the Pangu restore function and jailbreak again. Saurik has already indicated that he will work hard to get Cydia compatible as soon as possible. The Pangu team has pulled the original download link, likely to address some bugs. We recommend you follow iClarified to find out when a safe version is available. Pangu8 1.0.1 has been released resolving an issue that could cause the loss of your photos. You can download Pangu8 here. Update: iOS 8 compartible Cydia released.